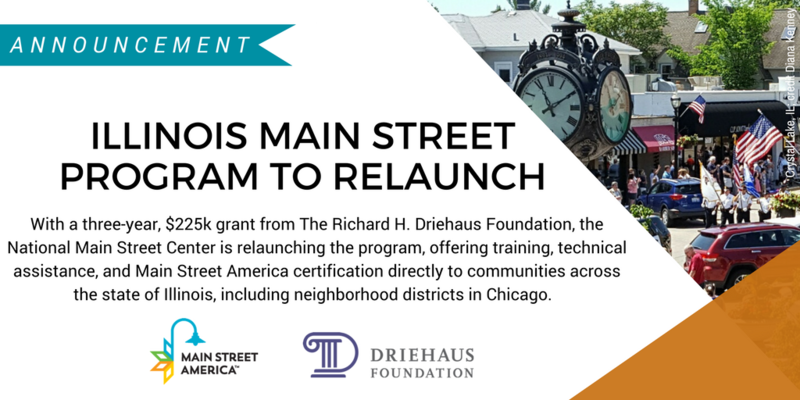 We are delighted to announce the relaunch of Illinois’s statewide Main Street initiative to reinvigorate local economies and support historic downtowns with funds provided by The Richard H. Driehaus Foundation in Chicago. In 2015, the Illinois Main Street Program, a 25-year-old state-funded program charged with overseeing Main Street revitalization efforts in the state, lost all state funding. With a three-year, $225,000 grant from the Driehaus Foundation, the National Main Street Center is relaunching the program, offering training, technical assistance, and Main Street America certification directly to communities across the state of Illinois, including neighborhood districts in Chicago. “We believe in the mission of the National Main Street Center and with this funding, Illinois communities throughout the state will again have the necessary support to strengthen small businesses, attract visitors, and enhance the quality of life for citizens,” said Richard H. Driehaus. 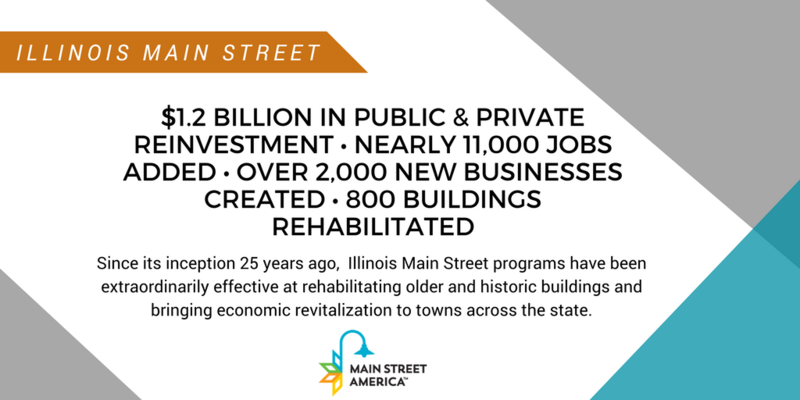 Since its inception, community-based organizations taking part in the Illinois Main Street Program have been extraordinarily effective at rehabilitating older and historic buildings and bringing economic revitalization to towns across the state. Collectively, these organizations have secured nearly $1.2 billion in public and private reinvestment, added nearly 11,000 jobs, created over 2,000 new businesses, and rehabilitated 800 buildings in Illinois. Illinois communities previously supported by Illinois Main Street include: Aledo, Alton, Batavia, Beardstown, Bloomington, Canton, Carbondale, Chester, Chicago, Crystal Lake, Dixon, Dwight, Elizabethtown, Freeport, Jacksonville, Libertyville, Lombard, Moline, Momence, Monticello, Mt. Vernon, Orion, Pontiac, Quincy, Rock Island, Silvis, Springfield, Sterling, and Waukegan. In addition, specialized services will be offered to selected neighborhood districts in Chicago through UrbanMain, a new program launched earlier this year that provides support to older and under-resourced historic commercial districts in urban centers. About The Richard H. Driehaus Foundation: Through strategic grantmaking, The Richard H. Driehaus Foundation seeks to improve Chicago’s built environment, to support cultural stewardship in the arts, to strengthen democracy through investigative journalism, and to advance economic opportunity for the working poor. The Foundation works to ensure the preservation and improvement of historic urban built environments and to ensure that new built environments are designed to meet the needs of the humans who inhabit them. The Foundation also makes grants that: cultivate a robust and diverse arts ecosystem, encouraging collaboration, advocacy, and knowledge sharing; support investigative reporting that fosters greater transparency, accountability, and effectiveness in government institutions at the local level; and support system-wide change to improve economic opportunity for the working poor that reside in urban areas by funding nonprofits active in public policy and advocacy.